QuakeDroid is Android Quake that should run on any Android phone made in the last 5-6 years, but has only been tested on 2 phones (one 32-bit, one 64-bit). Designed to have controls similar to popular mobile games (/cough Minecraft). Went deep on the documentation to try to empower the user. Does not require Quake to install, it downloads Quake shareware on startup. * Where is your Quake folder? * How to set a startup command line. The menu has 2 methods of navigation, you can touch items like "Single Player" or manually slide the volume slider bar or use the menu nav buttons. Sometimes when the config.cfg is being written, for reasons I don't understand the config file gets truncated and it doesn't write the whole thing. Must be some sort of "Android NDK thing". Delete your config in ad folder. When I do an update next around Christmas either I'll do some research and find out why Android NDK may sometimes write incomplete files or have QuakeDroid ignore an incomplete config by writing a checksum into the config header. Android is known to arbitrarily terminate applications whenever it likes, which means verifying the file wrote completely wouldn't work if that is what is going on. I deleted config files in AD and id1, as well as autoexec, and it didn't seem to help. I'll putz around with some other stuff too. Btw, I did want to say, despite my issues with AD, everything else I've tried has worked amazing. I'm going to be getting a GPD XD Plus this week and I'll try it on that as well. I suspect that will be an excellent match. And my phone that I've been testing on is a Lenovo Moto e4. Any chance you've messed with adding Touchstick style controls (like in *cough* Minecraft or PUBG), and the ability to hold shoot down and then still look at the same time. When I work on stuff again around Christmas, I'm going to hit up controls more. Never forgot about your input on that, it just kept getting bumped by [insert bug report] or [insert usability issue]. I just got my GPD XD+ today, and while QuakeDroid seems to work really great, there's a major issue: the display is turned 90 degrees, and I can't seem to figure out how to fix that. Any ideas? Do you mean upside down? Or do you mean it renders as a tall screen like this picture? In Menu->Options->Video Mode, what resolution does it say? I agree this is major issue, so I will try to do an update Sunday to solve your issue if time will allow me to do it. Android is really diverse in devices, versions and configuration. It lists my res as 720x1280. Also noticed that sometimes the sound randomly doesn't work, but closing and reopening a couple times brings sound back magically. I have the new "portrait-verify" version done that I hope will resolve your. I'll be uploading it in the next 24 hours after I double check some things tomorrow. Since I don't have the issue myself, you are the only one I can think of that can verify it solves your issue. I'll keep an eye out for your update. Looking forward to trying it out. I think it should work. But coding for a situation you cannot duplicate is never a sure thing. I'm happy to report that your fix works great on my 2018 model GPD XD Plus. For other GPD owners who care, I suggest setting the gamepad touch mapping off (push the gamepad button and push reset) and then use the config GUI from GPD to select Xbox control emulation. Works great! I am glad it solved your issue. Well, here's proof it worked. Thanks again Baker! Some apps appropriate the volume buttons for their own purposes (example: naked browser, which can be set so that it navigates through tabs). Such buttons could be used for weapon switching. When doing this, the "next weapon" button could be done with, enabling more screen real estate. Add support for the volume+ button to shoot, volume- button to cycle weapons. Surely this is possible since the camera app can takeover the volume buttons to take a picture. I was trying to play this with an otg keyboard and mouse and found that the mouse can navigate (the mouse is oriented for portrait mode and awkward) it can't be used for aiming. I'm not really interested in aiming with a touch screen so hopefully this is something that can be sorted. First of all, I just installed this, and I love it. 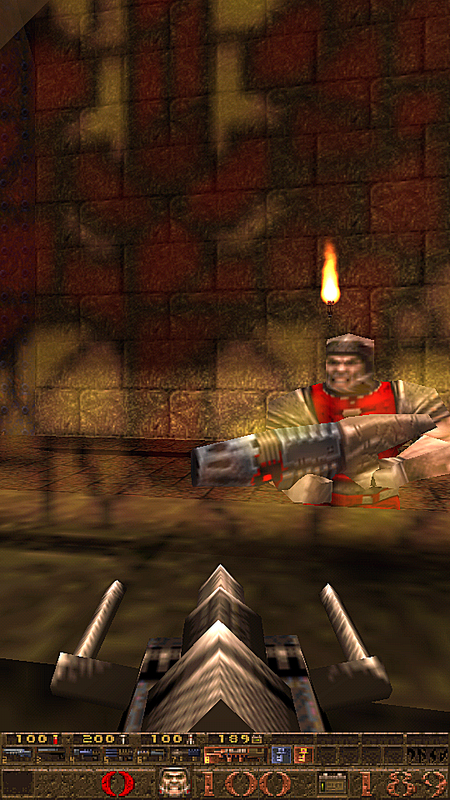 It's about time Quake 1 made it to Android in a decent form! Trying this on my Shield TV and the game defaults to "portrait" mode. Is there a way to force the game to stay in landscape mode? Also, Android TV doesn't show an icon when this is installed, any chance you can enable that little function in a future build? Also of note is that the look axis is uninverted by default, and there's no way of changing this without manually setting "joy_invert "1"" in config.cfg. The game correctly detects the Shield controller inputs, but has the L and R triggers swapped - it reports L as R and vice-versa. Visually, this looks great, except there's a really weird glitch where the red lighting shows as blue. The easiest place to spot this is around the lava ball in the Hard difficulty corridor. One other glitch I get is that there are a number of brown squares on my screen at all times. I suspect they're for touch input elements? They stay there even if I disable touch.